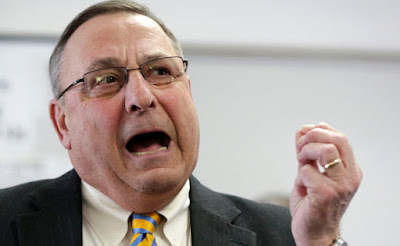 Pictured is Paul LePage, the Governor of Maine, and by all accounts a rather rightwing politician. On Wednesday, June 24th, LePage spoke to an audience of youth leaders at Dirigo Boys State, a youth leadership program held in Waterville, Maine. Nick Danby, the son of George Danby, who is a cartoonist for the Bangor Daily News, was in attendance at Dirigo Boys State. He asked the Governor a question, and in the exchange that followed, as LePage became aware of who Nick Danby was, the Governor said that he would "like to kill your father." On July 13th, it was reported that LePage has now apologized to Nick Danby, who has said he forgives the Governor for his remark. George Danby, incidentally, the cartoonist father, doesn't seem to be quite as forgiving himself, perhaps thinking of those cartoonists in Paris who were so recently killed by persons offended by their cartoons. Why should the Governor be inviting something comparable in Bangor? I'd like to suggest that we should take very seriously the use of the word "kill" as a part of political dialogue. It shouldn't be acceptable, from either the right or the left wing! 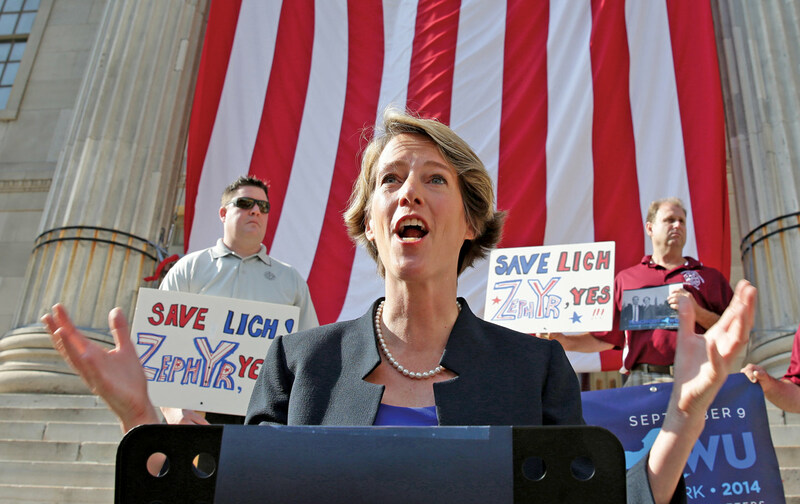 On the left wing, the July 20/27, 2015 edition of The Nation has an article on Zephyr Teachout, an inspiring and "insurgent" progressive who challenged New York Governor Andrew Cuomo for the Democratic Party nomination last August. Teachout is pictured below. Teachout's use of the word "kill" in this statement is a lot less objectionable than LePage's remark, at least to my ears. Nonetheless, Teachout's use of the word "kill" suggests that politics and "killing" are compatible. I don't think that the protesters in Hong Kong, struggling for a more democratic government, actually had "killing" in mind. I don't actually think that they would have "killed" to get the better politics for which they were demonstrating. At least I hope not. "Killing for a better world" does not compute, and we should be careful about the language that we use. If it is true, as I believe, that we walk across a "bridge of words," to get from where we are to where we end up, then we need build a bridge to a better politics without mobilizing the word "kill" as our route across the gap. If the bridge we build is based on "killing," we are walking in the wrong direction.